So I was looking under the hood the other day and noticed this. Is this right? Shouldn't it be on Zero? No point in worrying about it if the engine is not running. 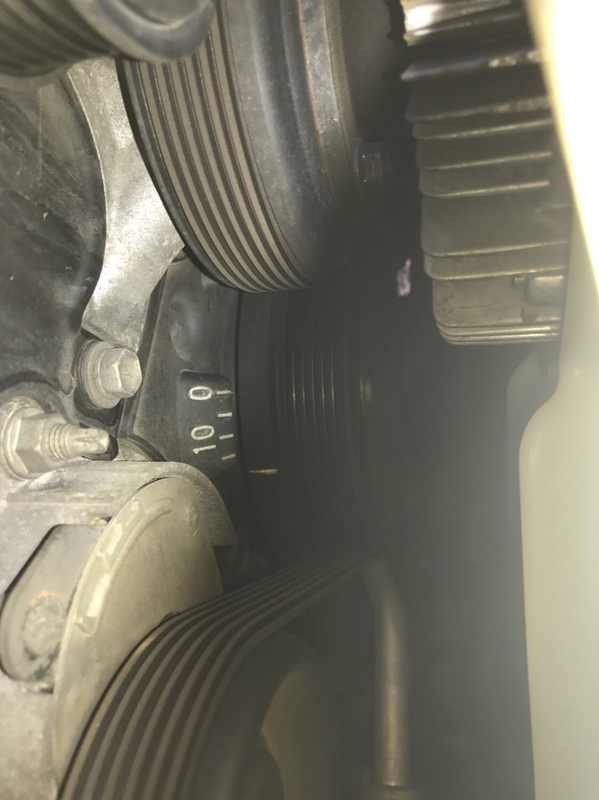 You typically check ignition timing with the engine running at idle, full operating temperature and with a timing light. Given that these modern engines are completely computer controlled you can't adjust the timing without reprograming the ECU. For giggles you can hookup a timing light and look at it. When you swap the cambelt or chain you use this to determine TDC of the crank to make sure the cams are lined up correctly. The manual typically will explain the exact position of the crank (which you an determine form these marks) and the cams (who has other markings on them). And that's where I left it...I have one more day off work and would really appreciate any advice on this. Did I f*** my car up? because I didn't return it to 0* before taking off old belt? Is there a way to address the issue if so? Get the Factory Service manual, it should describe how to align the cams, crank, etc for a belt replacement. The OEM belt also has marks on it to help with the process. This way you don't have to guess. PS: I removed the double post, and updated this thread title to be more descriptive as well as moved it to maintenance. This way it is easier for people to see, pay attention and help. This is after I removed belt and before I replaced water pump. Cams were line up with the "T" and the crank with the notch to pimple. Did I do it correct? Just double check the Factory Service Manual, last I checked they give pretty good instructions on how to locate the belt and teeth on the cams/crank. See FSM for the alignment of the cams and crank with the belt. Do you have an OEM belt? If so was there any marks on it for the cams? Last edited by Chewyspark; 01-24-2018 at 09:05 PM.